One of our greatest pleasures from remodeling a home is seeing our clients’ goals and desires realized through our efforts. At Atlanta Design & Build, we promise to enrich the lives of our clients and their families through a design that transforms their home environments to match their individual lifestyles. 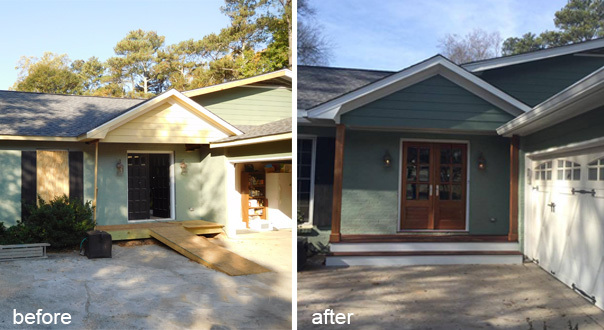 We began sharing the transformation journey of our clients’ 1960s split-level home in October 2016. Through a series of episodes affectionately titled “Raise the Roof”, our HomeStyles Online readers were provided an insider’s glimpse of a renovation in process. Snippets of step-by-step progress have been shared; from the literal raising of their roofline to create their desired vaulted ceiling, to cabinet and flooring footage creating an updated kitchen and open floor plan family room. Most of the homeowners’ boxes are now unpacked and they are ‘resettling’ into their new space. They welcome you to take another peek at their gorgeous renovation in this video! Follow this story from the start and see us raise the roof, the beginning stages of the interior, our ADB team hard at work, and in-progress photos. Watch all of the progress videos here. We have been hard at work on this 1960’s split-level home transformation we’re calling “Raise the Roof”. Throughout this project we have given some glimpses into the extensive remodeling work happening. Our client’s project includes an updated kitchen, new entry way, a screened porch addition and an open floorplan concept for their family room with a higher vaulted ceiling. They needed us to raise the roof which is JUST what we did…LITERALLY!! Project Manager Sydney Contant, along with the rest of our team, pays close attention to every detail of our clients’ projects. She recently took a few in-progress photos for documentation and we thought it would be fun to share them with you. These are images not many people get to see outside of the ADB team and the family whose home we are working on. Enjoy this unique behind-the-scenes look at what makes us Atlanta Design & Build. You will especially like referring to the earlier photos and videos we’ve shared of this project to see the difference being made! Look for clickable links below for an easy path to comparing the early photos with the more recent ones. Above is a view of the new front porch. Be sure to watch our time-lapse video of the roof being installed. The new brown front door looks so inviting! These next four photos show the screen porch addition and the installation of stonework around the fireplace in the porch area. Click on these photos to get a closer look and also visit the Raise the Roof Part 2 blog post for a full view of the screen porch being built. Finally, we head inside to see the open floorplan of the kitchen and family room. The kitchen cabinets offer wonderful storage solutions for this family. You HAVE to compare the before photos of the kitchen and family room from Raise the Roof Part 2 with these! 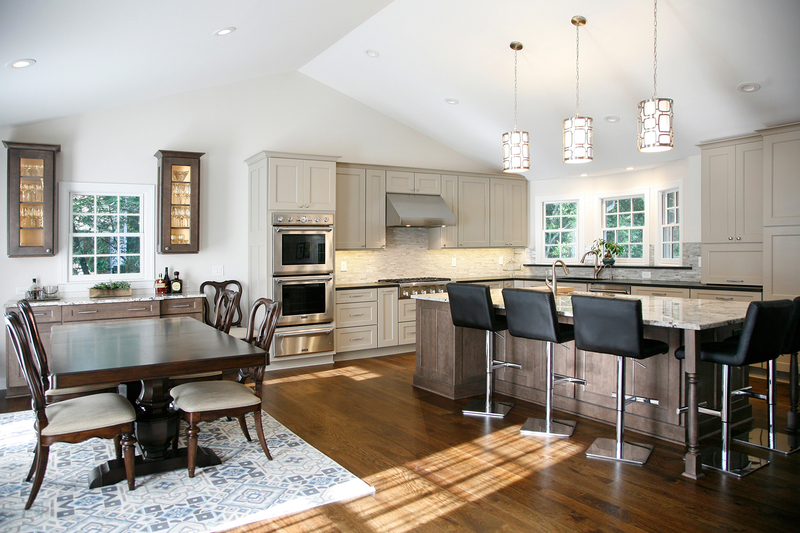 It’s incredible to see these spaces come together, one of our favorite parts of every remodeling project. Look at the details: See the vaulted ceiling and the beautiful flooring? Do you remember seeing the video featuring the drywall ceiling and wood flooring installation? Watch it now for a refresher and be amazed! Also, notice that gorgeous barn door in the family room. This leads to the basement where we improved the staircase that leads to the newly updated laundry room space. Our excited homeowners are anticipating the move back in to their remodeled home. Once they have settled in, we will have the final photos taken to show the full beauty of this project and the ways that it is improving the lives of our clients. Is your house no longer fitting you and your family? 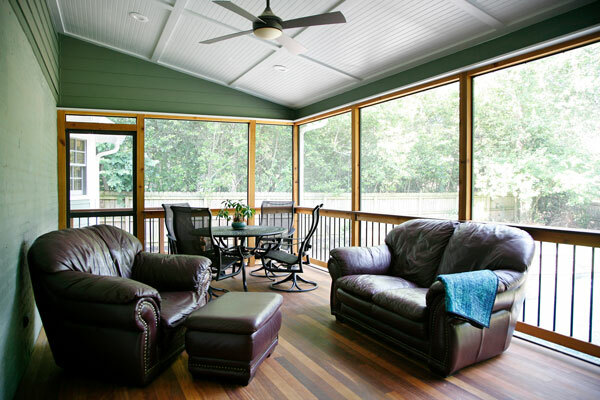 Before you think about moving, consider remodeling with Atlanta Design & Build. 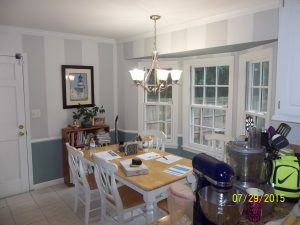 We can transform your home to enrich your life, just like we are doing for this family. Call us today and let’s discuss how we can improve your living space to meet your family’s needs. Follow this story from the start and see us raise the roof, the beginning stages of the interior, our ADB team hard at work, and the final product. Watch all of the progress videos here. 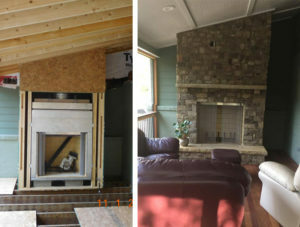 We’re giving you a peek at some of the interior remodeling work we’ve completed on our clients’ 1960s split-level home. Silent film style! 1. Perform an amazing balancing act on stilts! As our team is taping and mudding the ceiling after drywall installation, stilts make the job much easier. 2. Install a beautiful wood floor. 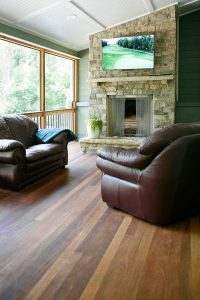 Our partners at InsiDesign are installing high-quality random length Hickory wood flooring. 3. Brick up a window opening. The kitchen cabinet design required the removal of a window. Here the brick masons are installing the brick on the Sunroom side of the wall, which will then be painted to seamlessly match the rest of the room. Follow this story from the start and see us raise the roof, the beginning stages of the interior, in-progress photos, and the final product. Watch all of the progress videos here. 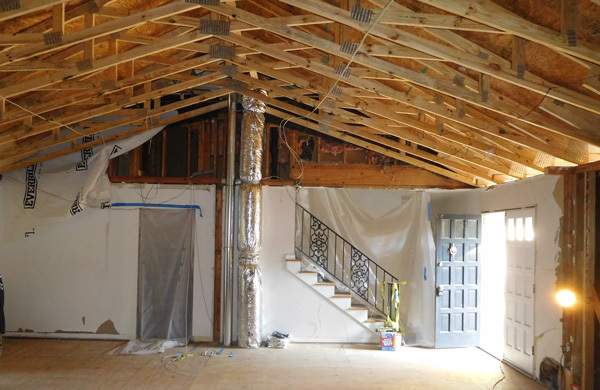 Here’s a glimpse into the extensive remodeling work happening at our clients’ 1960s split-level home for a whole house remodel. 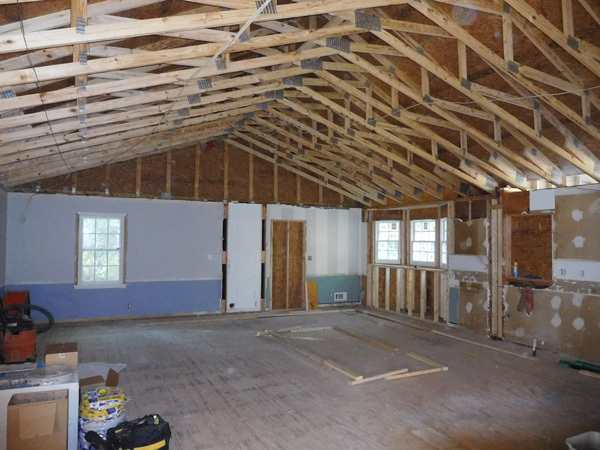 After their roof was installed, the beautiful transformation began. 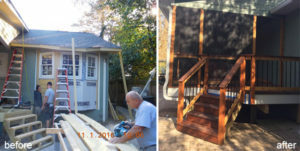 This exterior photo (above) highlights the beginning stages of their screen porch addition that includes an outdoor fireplace. 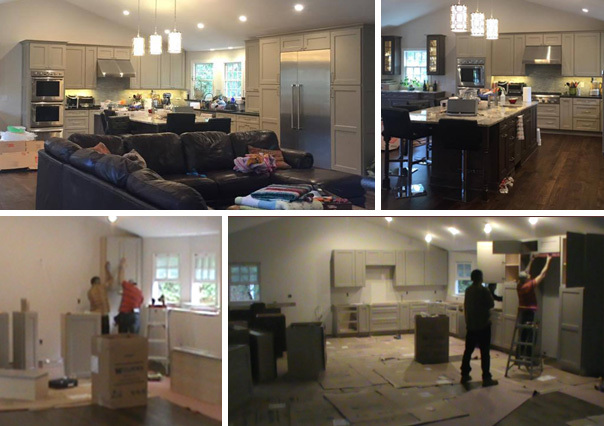 The interior photos show current progress being made on their updated kitchen, new entry way, and family room with an open floorplan. You’ll enjoy watching our ADB crew hard at work on various parts of this project in part 3 of our series. Voilà…each job is done right before your eyes. The 1960’s split-level home for this family of four was in desperate need of help. 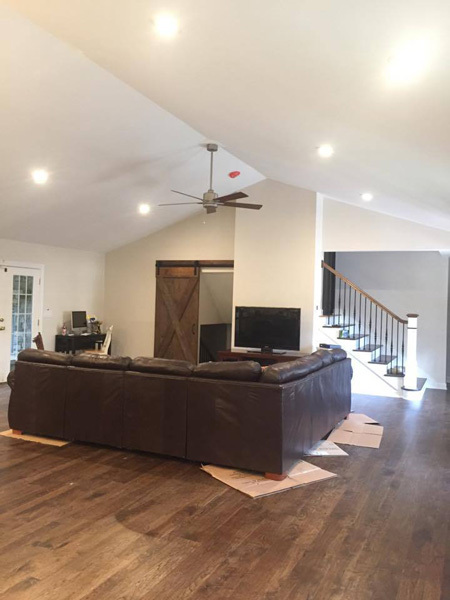 Our client desired an updated kitchen, new entry way, a screened porch and an open floorplan concept for their family room with a higher vaulted ceiling. They needed us to raise the roof which is JUST what we did…LITERALLY!! Follow this story from the start and see us raise the roof, our ADB team hard at work, in-progress photos, and the final product. Watch all of the progress videos here.